If you are lucky, you might get a composer with Leonard Bernstein’s popular appeal and intellectual aptitude every fifty years or so – a man with the musical skill of Herbert von Karajan, but not so much of the exclusivity and sourness that made Karajan distant and unlikeable. In fact, it is difficult to imagine how one person could contribute more to the consumption of music than did Bernstein: Aside, obviously, from his capacity as a composer, having written one of the great musicals of our time in West Side Story, Bernstein saw the importance of helping those who are otherwise non-musical to understand why it is that someone like Mozart is great, and why, exactly, Mozart’s music is foundational and intriguing. He knew, too, that the conducting profession entailed something far greater than merely touring around the world with an accomplished orchestra in order to offer respectable interpretations of the great pieces. Bernstein was great at doing just that, of course, and much more; but humans need, in some sense, to be taught, and if Bernstein excelled in anything, it was in teaching children and adults, college graduates and working men, alike, about what it means to truly appreciate music. One of the keys to interpreting Bernstein’s career thus seems to involve the importance of music education – not just playing band in high school, or hearing a few minutes of Bach on the radio as you drive home from school, but actually studying the mechanics of music and appreciating its fruitful historical unveiling. Bernstein’s contributions to the field were invaluable, but the study of classical music remains stigmatized in twenty-first-century American culture precisely because it is seen as the stuff of snobs and cultural pedants. In light of Bernstein’s proper legacy as an educator, this development seems tragic, and I think he would be the first to point out the necessity of reaching the poor, the marginalized, and social outcasts of all sorts with the transforming power of music. Bernstein’s approach to music education can be adequately summed up by his ability to analyze with relatable language and accessible conceptual lenses the works of great composers – his knack for lecturing with passion, precision, and charisma. He never shied away from structural detail, but he also never allowed esoteric technicality to get too much in the way of his listeners’ apprehension: With regard to Beethoven’s central talents, for example, he remarks, “In Beethoven’s case, the form is all, because it is a case of what note succeeds every other note; and in Beethoven’s case it was always the right next note, as if he had his own private telephone wire to heaven …. Inevitability – that’s the word for it.” A renowned connoisseur of the inscrutable Mahler, Bernstein used the notion of inner conflict – indeed, relating it to his own life as a composer and a conductor – to explain the tensions and struggles inherent to Mahler’s glorious symphonies. And when it came to the eccentric Berlioz, he delighted in discussing the elusive, imperious idee fixe pervading the Symphonie Fantastique and lending to the psychedelic romanticism of an early-nineteenth-century work. Whenever he wanted to illustrate a point, of course, he only had to turn around and point his baton to his personal assembly of musical masters – the New York Philharmonic – to make it happen. Bernstein even tackled such difficult subjects as the nature of American music and the many possibilities of melodic structuring in certain lectures he gave … to children! Called the Young People’s Concerts, these informative sessions brought together Bernstein’s youthfulness, his passion for people, and his musical sharpness in order to teach puerile minds all they needed to know about listening well during formal performances. In other words, he reached young people without having to use the typically frivolous shortcuts employed by disinterested adults in all venues of academic life; he taught them something they could hold on to, without pandering to them and without treating them as if they were the same age as their accompanying parents. And so it was that one of the great musical minds of the twentieth century focused on imparting his wisdom to new generations: As would any great teacher, he sought to cultivate passion for the musical traditions that Westerners continue to hold dear. 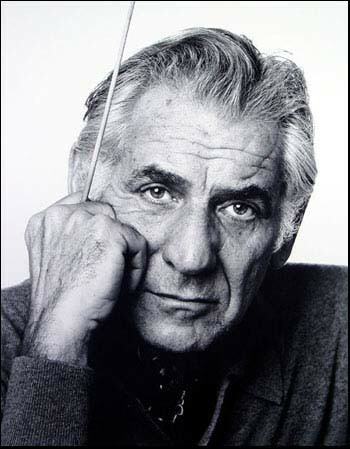 Regardless, perhaps Leonard Bernstein’s greatest legacy is not necessarily the individual impact he made in the worlds of composing, conducting, and teaching, serving as one of the definitive ambassadors of classical music to the general public in the twentieth century; perhaps his greatest legacy, rather, is the fact that when we hear the transcendental beauty and truth that good music has to offer – when we think of Beethoven’s humanness and sublimity, Mahler and his torturous complexity – we see, in part, that dignified, deep, emotional man with a cigarette in his mouth, sitting upright at a piano or on a raised platform, motivating us to understand the art with which we have been thoroughly blessed. And for that alone, I think we are inexpressibly thankful. When Bernstein traveled to Berlin in 1989 following the fall of the Berlin Wall, the inspiring maestro decided to change the German word for joy, “Freude,” with the German word for freedom, “Freiheit,” in Beethoven’s epic final symphony. He did so because he knew as well as anyone the spiritual and even political intricacies of music’s significance to our souls: Even though he died shortly thereafter, his memory lives on just as music continues to bring beauty to the lives of the lost, changing the fortunes of kids who, instead of video-gaming or mulling about sketchy malls listlessly, are experiencing the intricate notes and delightful tones of their first melodies. Author’s correction: Bernstein’s writing of “West Side Story” is indicative of mid-twentieth-century American sounds, not of mid-nineteenth-century sounds. Masterfully written. It’s hard to believe you’re but 19 years old. Must have had great parental guidance! Wait, how do you know I’m 19 years old?